One of the best concerts I ever attended was a show at the Van Duzer about 10 years ago with a stellar collection of Cuban masters on tour under the Buena Vista Social Club banner. When I mentioned how much I liked the band in a recent conversation with bandleader Juan de Marcos González, he was quick to correct me: "Buena Vista Social Club is not a band, it's a brand," he told me, following with a long story about how Ry Cooder ended up getting much of the credit for the success of the Cuban stars he had assembled. González was tired; he'd spent the week rehearsing the latest line-up of the Afro-Cuban All Stars, teaching them new tunes and old ones. "As always the, Afro-Cuban All-Stars is much more than a band," he said. "The line-up is friends who love this music; they have played with the best Cuban bands over the years. Some are young; the rest are not that young. They live all over the world. My goal this time was to make an international Afro-Cuban All Stars. The music we play is in all the different styles of Cuban music, from the traditional up to contemporary forms; that's what we perform." Everyone in the new lineup is a Cuban expatriate, a practical choice driven by immigration politics. 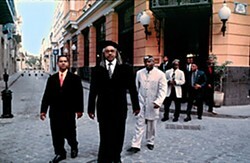 Particularly since 9/11, getting Cuban musicians into the U.S. has been quite difficult; many tours have been canceled. "Your politicians have had the embargo for more than 50 years without much happening," said González. "In fact the embargo is obsolete. But with this band it's not a problem because they all live abroad and many have passports from other countries." He's hopeful that change is coming. "I think that Obama is going to change everything," he said, predicting an end to problems between Cuba and the U.S. "But I don't want to be an ambassador," he added. "I'm not a politician; I am a musician -- I don't think in political terms." 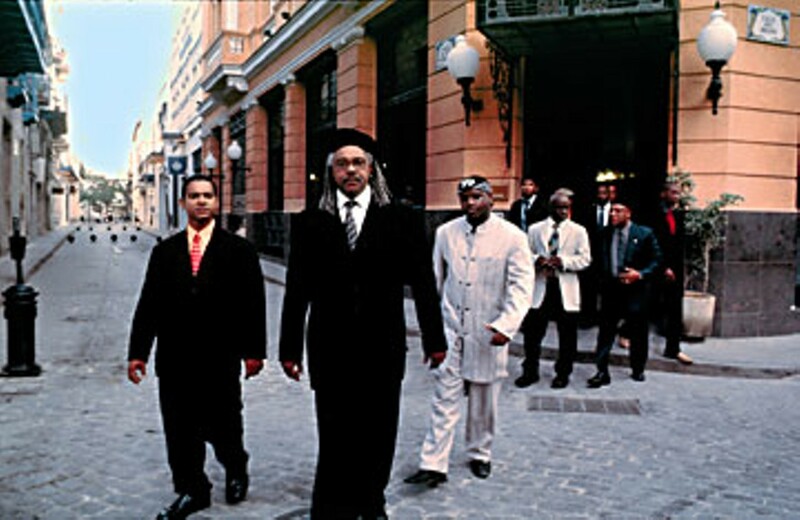 González and the Afro-Cuban All Stars begin a two-month American tour this week; González returns to the Van Duzer Sunday night for another memorable night of music. Arcata's multi-culti house of dance Redwood Raks celebrates its first birthday Friday night with a party featuring tons of dancers: Ya Habibi Dance Company bellydancing (of course), burlesque/bellydance fusion by The Widowmakers, Samba Na Chuva doing the Brazilian thing with The Janky Mallets, Humboldt Rockers breakin', New World Ballet's hip hop kids, Company of African Dance Arcata, Salsa Organica and Freelove Circus (their respective names explain what they do), all capped off with a fire dance in the courtyard by Nightshade Serenade (weather permitting). Bonus: birthday cake at intermission! You'll also find Samba Na Chuva and Janky Mallets at Six Rivers Tuesday for a Fat Tuesday (Mardi Gras/Carnaval) bash. And you can expect some of the same folks at the Red Fox Saturday for an early celebration of Carnaval with Caribbean, Brazilian and West African rhythms. Carnaval Cabaret organizers promise "drumming, dancing and debauchery" from WoMama, SambAmore and Dun Dun Faré with dance troupes: Ya Habibi, C.A.D.A., and the SambAmore dancers. Mad saxophonist Skerik is back in town with Skerik Trio, a stripped down jazz/jam machine that includes Marco Benevento (of Benevento Russo Duo fame) on keys and a young jazz drummer from Seattle, D'Vonne Lewis. Catch them Friday at the Jambalaya. Across the Plaza at Mazzotti's Friday, local hip hop kings Potluck bust out a new CD, Pipe Dreams. The Arcata show features some high-power guests: Luckyiam (from Living Legends) and Killah Priest (of Wu Tang Clan) plus locals L.C.A. This is a rare hometown appearance by Potluck's Underated and 1 Ton who hit the road next week with Kottonmouth Kings (guests on Pipe Dreams) and La Coka Nostra. On the dubbier, underground side of hip hop you have Heavyweight Dub associates A.P.O.S.T.L.E. and Dr. Israel at the Red Fox Friday with Resident Anti Hero. More hip hop Wednesday at Humboldt Brews as CenterArts presents the infamous rapper Keith Thornton -- aka Kool Keith of Ultramagnetic MCs, aka Dr. Octagon, aka Dr. Dooom -- with kutMasta Kurt on the wheels of steel. Is Keith as crazy as they say? On his latest disc, Tashan Dorrsett, he advises skepticism: "Some say I used to use witchcraft, reports say I've been to Bellevue, sources read I practiced voodoo. You tell me assholes what you assume is true? Investigate all myths ~~~til you turn blue." Jared Livella, drummer for Wiretapped and Machines Go Wrong, celebrates the grand opening of Livella Studios Friday at 120 2nd St. (in between Two St. Music and the Rescue Mission). Stop by between 7 and 11, check out the studio and have some free food, and no, it won't come from next door. Don't know how it slipped by, but last week's reggae report should have mentioned that Stephen Marley (Bob's son) is playing solo and acoustic at Toph's House Wednesday, Feb. 18 (the day this issue hits the street). Stephen's been touring with Somalian-expat hip hopper K'Naan, who is about to drop his second album, Troubadour. K'Naan is at Toph's Thursday, Feb. 19. More reggae? JA dancehall luminary Sister Nancy, the Queen of "Bam Bam," is at Mazzotti's Saturday, Feb. 21, with Brooklyn-born Rastaman Rocker T, Irie Dole, Dash Eye, Ak and Tanasa Ras and local fave JahSun. And you have British lover's rock star Lloyd Brown singing Tuesday at the Red Fox backed by Berkeley's 7th Street Sound Band. On the folky/indie front: Strix Vega's buddies from San Fran, Or, the Whale play Thursday at the Pearl Lounge. Sorry, S.V. is laying low until CD release time. Instead it's local songwriter (and former Journal employee) Sarafae opening and Side Iron closing. Leftover Salmon mandolinist/vocalist Drew Emmitt plays his jamgrass at Humboldt Brews Friday with the appropriately named Drew Emmitt Band. Saturday at HumBrews it's a pair of S.F. indie outfits: Izabella, "a rock and soul band," and Ten Mile Tide, who describe their sound as "high-energy folk-rock, feel-good Muppet funk and beer-drenched bluegrass." Blonde guitar shredder Catherine "Cat" McLean is up from the Bay for a series of shows with her rockin' band, also known as Cat. Thursday they're at Humboldt Brews, Friday and Saturday they hit Blue Lake Casino's Wave Lounge. Cat's people tell me that Cat and her guitarist Jon Mulvey, who count Peavey Electronics among their sponsors, have been using recent Cat concerts to help out organizations like Arcata Endeavor (did they change their name?). Peavey provided a guitar to be raffled off "as a great way to focus the community's attention on great people doing good deeds for folks in need." Raffle tickets ($5) at Arcata Endeavor, HumBrews and Blue Lake Casino where they'll give away the guitar Saturday night. The ladies of Humboldt Roller Derby present a Sugar and Spice Fundraiser Saturday at the Eureka Veterans Memorial Building. The skaters' hoedown features music by Rooster McClintock, Side Iron and an unnamed Neil Young cover band, with DJ Anya the Bunny Slayer spinning discs (or working the laptop, whatever that's called). Bonus: cheesecake served by derby girls -- on wheels. How about one more benefit? The Eureka Skatepark Karaoke Kontest Fundraiser is Saturday night at the Boiler Room. Karaoke king Chris Clay will man the k-machine; a couple of dozen karaoke kontestants are expected to kompete for prizes. So-called "celebrity judges" include Eureka City Councilman Jeff Leonard (who will give a skatepark update), Rutabaga Queen Shaye Harty, KSLG's infamous Dr. Syd Reagan III and yours truly. The organizer says he'd "like to have an American Idol-esque judges' review of each contestant: observations, criticisms, witticisms -- whatever the very knowledgeable and respected panel of local celebrity judges would like to offer." Hmmm, which Idol judge should I emulate? Is there a silent one?